Lecco is a quiet town in northern Italy sitting on the eastern shore of Lake Como at the base of the pre-alp mountaintops. Its picturesque city center with cobbled stone streets and church towers is going through a slow but steady commercial metamorphosis. Once upon a time, Lecco was a booming, prosperous city called the “The City of Iron” because of its rich metal production. Boutiques very consciously stayed on the conservative side of the market fence offering upscale clothing, accessories and fashions that would sell to the prosperous population. However, this conservatism bored some of the youth, who as a consequence, left Lecco in search of new experiences and exploration of bigger cities. Now, these youths are thinking about settling down having their own families and are returning to their hometown with new ideas and projects. Massimo Boldrini is one of these returning youths, and has opened Mr. PMA Tattoo & Barbershop. Walking past the shops at Via Cavour 23, heading up towards the station there’s a shop window with vintage style lettering proclaiming “Mr. PMA Tattoo & Barbershop” and under the name which is an acronym for the slogan “Positive Mental Attitude”. Through the window, you can see an old-fashioned barber chair, a wooden counter and tools of the trade carefully laid out straight and clean ready for the next customer. Mr. PMA is owned and run by Massimo Boldrini a.k.a. Max. Max looks like someone you certainly don’t want to mess with. He’s 6ft tall, with line-backer shoulders and has tattoos that spread from his collar to his neck up to his face and forehead. In fact, he was managing director at a well-known nightclub. There are two other Mr. PMA shops; one in Erba and one in San Remo. Max travels every fifteen days making sure things are running smoothly. Everything in the shop is carefully curated. The antique furniture, product displays and the lighting all give you the feeling of being in one of those universally familiar barbershops we see in 1950’s movies filmed in Brooklyn. Unlike the tradition and clean cut culture of the 50’s, Mr. PMA is not looking to create conservative cut-outs, but the complete antithesis. His slogan “Positive Mental Attitude” provokes not only an optimistic message, but also a message of freedom of expression and liberty to be who you want. Hence, the marriage of barbershop and tattoo studio all on one premises. Gianmo is doing a shave today on Marco, who has kindly agreed to be photographed for us. Gianmo starts by cleaning up after the previous customer. He sweeps up the hair cuttings and dusts off the chair. Marco is invited to sit down in the original 1958 Jupiter barber chair and is wrapped in a black cloak. Gianmo tilts the chair back and the customer is laying comfortably horizontally. Marco has a three-week beard growth, and today will be getting a cool, clean shave; the full works with hot towel and facial massage. Gianmo gets to work, starting with a pre-shave hot towel treatment. The towels is humid and heated in a special oven and then placed over the customer’s face giving a sensation of warmth and relaxation while preparing the skin by opening pores and softening the beard. Next, a good spreading of soapy foam and he’s ready for a flat razor shave. He does three shaves in all; twice against the growth and a final overall finishing shave. His movements are swift and crisp. You can hear the scraping of the razor against Marco’s cheek. He slows down the pace when the blade nears the lip or the jawline near the earlobe. Apart from these sensitive areas, every swipe is rapid and concise. Marco, the customer, is calm and relaxed with his eyes closed. He said he would have fallen asleep if could. Gianmo finishes rinsing the excess foam off the clean-shaven face. He applies a cold towel, which he explains “This helps close the pores and give a sensation of cool freshness.” He concludes the treatment with a talc massage, gently pinching, kneading and patting facial muscles. He uprights his customer and adds the absolute finishing touch; a drop of perfumed aftershave and a friendly smack. Marco examines his smooth skin in the mirror, happily satisfied with his new look. Albert Laphonse is the resident tattoo artist. “Resident artist” means he is based here but he will also occasionally do guest appearances in other studios nationwide and in return other artists will do work here at Mr. PMA. He left his job in a local factory, here in northern Italy, to pursue his creativity. He has a precise hand and is a master of designer lettering. Lettering is the tattooing of words and phrases with stylized custom fonts or calligraphy which is now one of the biggest trends in the tattooing world. Max attributes Albert as being a major influence of the trend and one of the best lettering designers in Italy. He is fully booked both here and during his guest appearances. Today, Albert is doing a tattoo on Denise, who has kindly agreed to be photographed for us. Albert designs his tattoos on paper and then transfers the general outline to the skin, but much of the final art work is done freehand. He is concentrated, yet relaxed having a friendly chat. Mr. PMA has opened a new market catering to the needs of the new generation while at the same time offering traditional services. 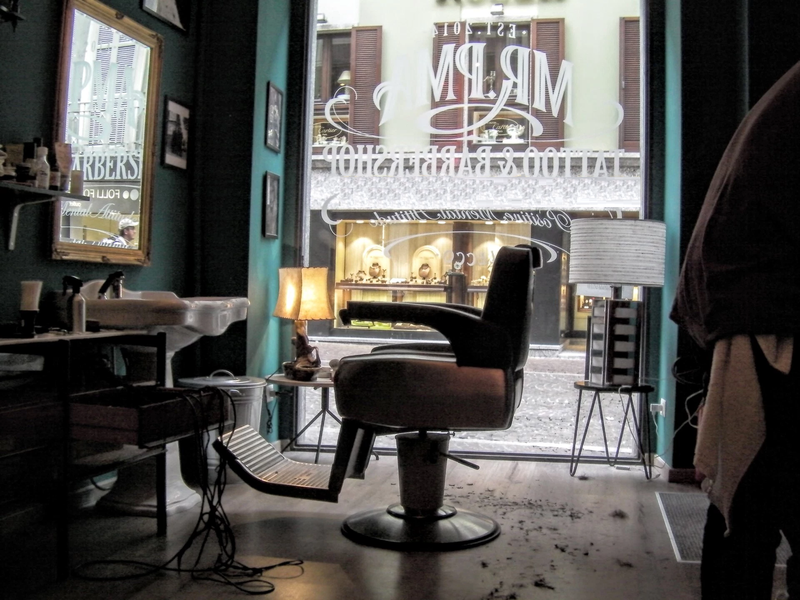 Most certainly, this is not the only barbershop in town, nor the only tattoo studio, but it is certainly the most authentic and stylish place in Lecco for men’s grooming.